Someone that suffers from rheumatism or arthritis, know what it’s like to live in constant pain. Till this day, the cause for this degenerative illness is unknown; we do know that infections, genes and hormonal levels may be related. Rheumatism or rheumatoid arthritis is an autoimmune disease, where the body attacks healthy tissues that swell articulations. It can be developed and any age, but it’s most frequent in mid-age to advanced age in women. It is very painful, progressive and affects the life quality of many people around the world. Most common treatments include strong pharmaceuticals consisting of painkillers and anti inflammatory, but with time they tend to leave toxicity residue in the main vital organs such as liver, kidneys, that affect lymphatic drain. The body becomes accustom to the medication and may create certain resistance, needing readjustment or increased dosage. We offer an I.V. detox protocol, using biological and medicine that is gentler on your body. This is important because detoxification helps clean your system from accumulated toxins over a long period of prescribed medication and it helps prepare the body to receive the biologic medicine. Using the protocol “Insulin Potentiation Therapy” or (I.P.T.) the doctor administers painkillers, anti inflammatory and antibiotic natural medicine. It is a cutting-edge biotechnology in the field of Alternative Medicine that integrates: homeopathy, homotoxicology, anthroposophical medicine and Ayurveda. Biologic Medicine uses only natural drugs made from living organisms that act as substances produced by the human body. These biologic agents can be human cells, benign bacteria, yeast, enzymes, antibodies or interlukins that help improve the biochemical reactions. Unlike chemically processed medicine that uses lab-synthesized ingredients. They are clear ampules of medication, made in Germany by HEEL Laboratories. The way this medication is administered is using I.P.T., this will assure that all medication is delivered directly to the swollen articulation en the precise therapeutic moment, enhancing and potentializing its effects. It’s such an effective protocol that medicine is better used, acting directly at the source of the problem over the affected tissue and you can begin noticing its effects after the second treatment. In total there 3 to 4 sessions and the cost is very reasonable. You will feel a noticeable improvement in joint mobility, reduced swollen and a considerable reduction in pain. Its effects may last for up to 10-18 months. 1 phase of treatment is recommended, maximum 2 phases per year. 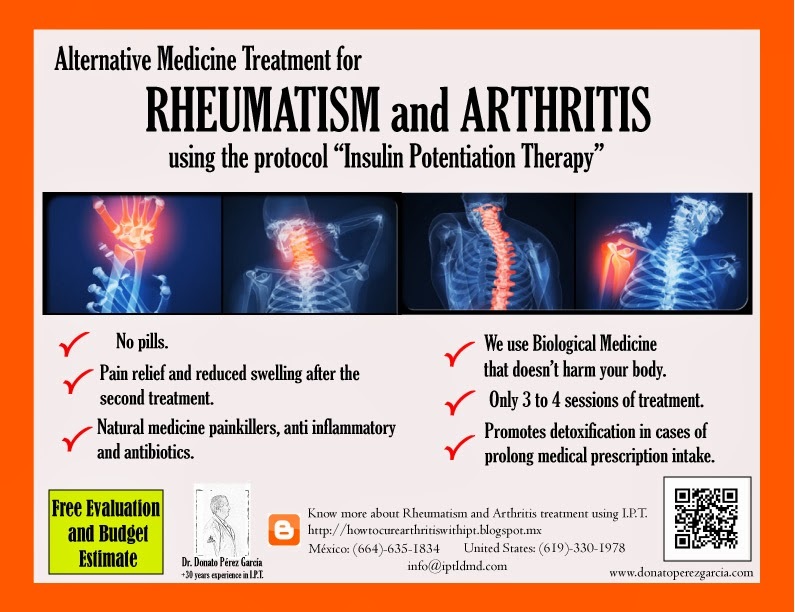 Unfortunately there is no medicine that can revert the damage or deformations caused by arthritis, non the less, this treatment does offer a better quality life, partial to complete reduction of symptoms, more health and vitality due to the detoxification. Dr. Donato Perez Garcia is who administers this treatment in Hospital Angeles in the city of Tijuana, Mexico. He’s the most experience doctor in the protocol of “Insulin Potentiation Therapy”. Call or write today, and get your evaluation and budget estimate, completely free.